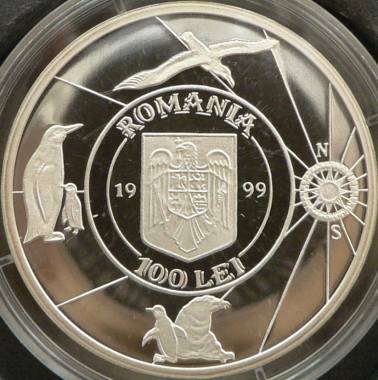 The coin was occasioned by the centennial of the antarctic expedition Belgica, participant to which was the famous Romanian scientist Emil Racoviţă. 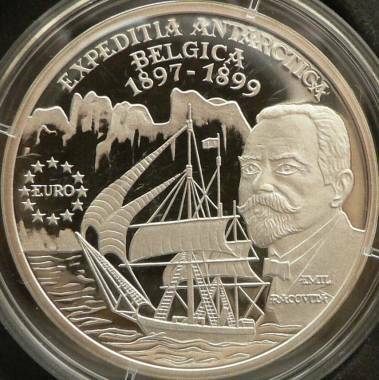 In 1998 Belgium introduced the centenary of the Belgica Expedition on the list of UNESCO anniversaries. Scientists from several European countries participated to the expedition, setting an example of international cooperation. Bearing on the reverse the 12-star circle and inscription EURO, this coin was dedicated also to the new currency planned for introduction by the European Community in 1999. 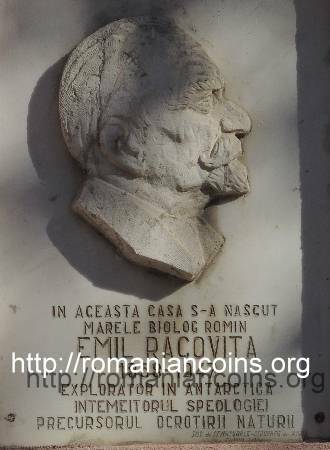 The Romanian biologist Emil Racoviţă (1868 - 1947) participated as naturalist to the Antarctic Belgica Expedition. Emil Racoviţă was between 1900 and 1920 subdirector of the zoological marine station Banyuls-sur-Mer in France. Most important, he is the founder of bio-speleology (science that treats the cave life forms and the underground waters). 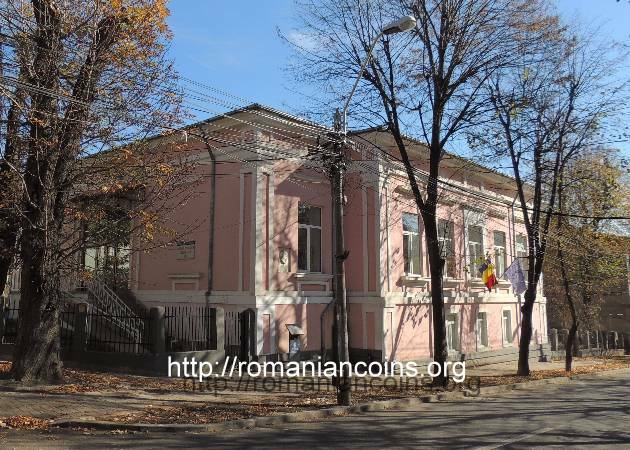 In 1920 he founded at Cluj (today Cluj-Napoca) the first world speleological institute. Between 1897 and 1899 a Belgian research expedition took place in Antarctica. The expedition was organized and led by Adrien de Gerlache, a Belgian lieutenant. Young Emil Racoviţă, at that time 28 years old, also embarked on Belgica ship. To the same expedition Roald Amundsen participated also, later to become the conqueror of the South Pole in 1911. The researches into the Antarctic region prooved to be very dangerous: two of the 19 members of the crew died during the expedition. The ship Belgica was 34 meters long, 270 tons and three masts. The ship had sails, and also a steam engine of 150 horsepower. Belgica advanced towards south as much it was possible, and spent the winter in the antarctic. Various meteorological observations for a complete year were accomplished. The annual medium temperature in Antarctica was calculated - the first such measurement. Several new lands were discovered and mapped, numerous landings were accomplished, and geological samples were collected. Numerous species of plants and animals new to science were discovered.